The military is, together with intelligence/security services, in a unique position to rip taxpayers off their money. Astronomical amounts of money. As Henry Waxman said about cash shipments that vanished in the Iraq war, “the numbers are so large that it doesn’t seem possible that they’re true”. Secrecy, impunity and propaganda creates a perfect environment to conceal crime and show a nice facade. 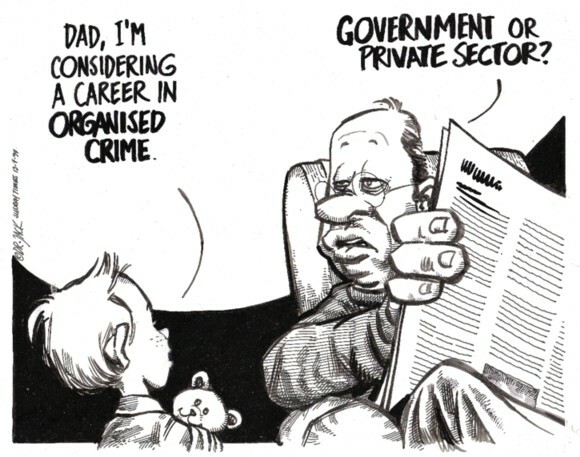 The private sector is of course deeply involved, for example in corruption in the arms industry. Will taxpayers be able to see through all this and stop the giant rip-off? Individuals who speak out about the military spending waste give hope, something that cannot be said about many politicians and contractors. This entry was posted in Uncategorized on 2015-08-25 by Webmaster. Mexico: Stop attacks on freedom of expression! This entry was posted in Uncategorized on 2015-08-21 by Webmaster. Gareth Williams was found dead in London in 2010. The suspicions against British authorities are now renewed after an article in the Daily Mail. Regardless of the cause of Gareth Williams’ death, a cover-up must be seen as a crime in itself. Migration and refugee issues have been widely discussed for many years, but too many have closed their eyes at the basic reasons of the problems and how to solve them. This year there have been some notable exceptions, which deserve attention. Anders Lustgarten, a British playwright, wrote in The Guardian: Refugees don’t need our tears. They need us to stop making them refugees. The US is the nation that contributed to the largest refugee flows in Europe in recent decades: NATO bombed Serbia in 1999 to prevent a genocide, which has already been implemented – Srebrenica in 1995. The real reason was to break down a socialist country. In 2001 the US bombed Afghanistan. The motive was to fight the Taliban, i.e. Muslim religious fanatical organizations. Interestingly, the US supported these groups economically since the 1970s in order to create a civil war, for easier access to oil and minerals. The Iraq war began in 2003 when the US wanted to destroy Iraq’s weapons of mass destruction. There was no, but oil. Since 2011, there is a civil war in Syria. The opposition consists of the US and its allies, particularly Saudi Arabia, but also Qatar, Turkey and the IS. IS is a strong military movement, which mainly recruits mentally war-wounded Iraqis. IS has previously received weapons from the US to break down the Syrian regime. Now US is fighting IS. By dividing the Syrian people, the US strives to increase its influence in the oil-rich and politically left-minded country. The war drives millions of Syrians from their homes and, like all wars, creates enormous human suffering. In Sweden, we are reminded of the war by the large number of refugees we receive. This year, we calculate to receive 100,000 people. In addition to the refugees’ own suffering, this creates problems in Sweden with growing tensions between already vulnerable Swedes and new help-seekers. When the US waged war in Vietnam during 60-70’s it was easier to realize how unjust war and world public opinion forced the US to stop the war. Now the US has learned that the world public opinion needs to be processed. The country should be attacked must first be denigrated – demonized – to create acceptance among world public opinion for an invasion. This happened before the invasion of Afghanistan, Iraq and Libya. Certainly there was suppression of parts of the population in these countries, but the situation became much worse for the people after the US destroyed the invaded countries. Sweden should work to ensure that the countries that, in violation of international law, are giving armed support to the opposition in Syria withdraw and instead invest weapons money on humanitarian aid. If war money was instead used for humanitarian aid, destitution would be reduced and thus a cause of hatred that is a hotbed of violence. Globally, 12 times more is spent on on military expenditures (1700 billion dollars) than international aid. The US accounts for half of world war costs. But the war has not only losers. The winner is the arms industry that equips war stakeholders before and during the war and the construction industry, which is booming after the war. A profitable cooperation. In Iraq, American and Western European construction companies have received many large orders, paid for with oil money. Iraq’s own construction industry was bombed. Sweden should require that those countries that instigate the civil war in Syria pays for the refugees that generate large expenditures in recipient countries. This is not likely to succeed, but can still be a mark against the countries that instigate the war in Syria. In addition, Sweden should discontinue military cooperation with NATO. What parties in parliament want this? If you want to read more about the US global war policy, I recommend The Strangelove Effect by John Pilger, published [in Swedish] by Karneval förlag 2015. This entry was posted in Uncategorized on 2015-08-20 by Webmaster. France is one of the countries that are responsible for many atrocities and let the perpetrators get away with it. We can now catch a glimpse of the horrible consequences. For example, the torture methods used in Algeria have been spread around the world. Recently, we could also read how French intelligence plotted to overthrow the Libyan leader in order to claim a hefty slice of Libya’s oil production and “favorable consideration” for French businesses. Libya is now a failed state, because of the crimes of France and other countries. This entry was posted in Uncategorized on 2015-08-19 by Webmaster. In Thailand, you can be sentenced to decades in prison for insulting the king. Read about the latest case of Pongsak Sriboonpeng and others. Some earlier cases are Somyot Pruksakasemsuk, Ampon Tangnoppakul and Joe Gordon. In Thailand it would probably not be possible to report freely about the Blue Diamond in the way done by Aftenposten (in Norwegian). Thailand is not the only country with terrible sentences for insults. Remember Raif Badawi in Saudi Arabia. This entry was posted in Uncategorized on 2015-08-08 by Webmaster. This entry was posted in Uncategorized on 2015-08-07 by Webmaster. At Accoun we want government criminals to face trial, but also they deserve a fair trial. Show trials, such as the one where Saif Qadhafi was sentenced to death, are unacceptable. Read what UN officials say about the recent trial of former members of the Qadhafi regime. His father, the dictator Muammar Qadhafi, was murdered in 2011, probably after being tortured (possibly even sodomized). This entry was posted in Uncategorized on 2015-08-05 by Webmaster. Can you imagine that anyone travelling illegally with assault rifles and pistols is just sent back and allowed to keep the weapons? Read about US soldiers travelling illegally with weapons (in German). This entry was posted in Uncategorized on 2015-08-02 by Webmaster.